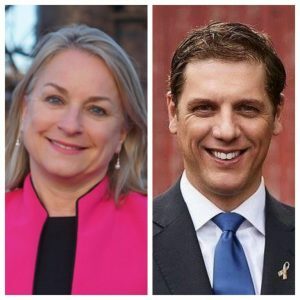 On Tuesday evening, the New York Times/Siena College completed their live poll on the race for the open seat in the 7th Congressional District between Democrat Susan Wild and Republican Marty Nothstein. The live poll concluded that Wild leads Nothstein 50-42 after 539 people responded, although 23,562 calls were made. The New York Times described it as a “modest lead” for Wild, although the margin of error is +/- 4.7%. Wild holds an advantage with women voters with 54% supporting her, while 38% of women who responded to that specific question say they are going to vote for Nothstein and 8% undecided. The male vote is split down the middle, with 46% supporting Wild and Nothstein, while 9% remain undecided. Despite the race being just weeks away, about half of those polled still don’t have an opinion on either candidate. Wild has a 34% favorable rating, with 19% view her unfavorably, and 47% don’t know. Nothstein’s favorability rating is 30%, while 22% don’t hold a favorable view of him, and 48% don’t know. As with most voters for Congressional races across the country, President Trump is playing a role. 53% of voters want the Democrats to retain control of Congress and disapprove of President Trump’s job performance, while 42% approve of the President and want the Republicans to maintain their majority in Congress and 5% don’t know. Where voters specifically disagreed on a Trump policy the most was their view of the North American Free Trade Agreement and tariffs on aluminum and steel. 59% supported NAFTA, while 30% opposed it, and 11% don’t know. 53% oppose Trump’s tariffs on aluminum and steel, with 39% supporting the tariffs, and 9% don’t know. This poll did not ask voters about Libertarian candidate, Tim Silfies. Every Hard Republican I know still slams the phone down every time any solicitation comes through, especially political ones. Remember that whole keeping the government out of our business thing? Yeah. Polls will continue to be skewed. I don’t doubt a serious Dem lean this year, but I think it’s exagerated if we’re just looking at polling numbers and what circulates in the media. They made 25,000 calls and got 500 +/- responses. Of those responses half of the people didn’t even know Wild or Nothstein. I agree that it was a flawed poll on many levels but what would you expect from something tied to the NYT. Tim will be in all the debates and he has been invited to all of the forums that have been currently held. Make no mistake this is a 3 person race. Obviously, the libertarian candidate could hurt Nothstein, especially in a close race. We have the recent example of Clinton and Stein to look at from 16. The questions on that poll are interesting. 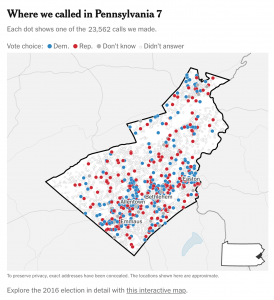 It shows how much the Lehigh Valley has changed over the last few decades. Cant imagine NAFTA would have supporting #’s like that 30 years ago. The 53/42 number says a lot as well. That is an indication of who is willing to vote. I would describe her lead as modest. The intriguing aspect of this race is will the Latino population turn out to vote? If they do not then Wild could certainly lose. Still, she is clearly in the drivers seat but that seat isn’t overly comfortable yet.